Now that summer vacation is approaching fast, it might be high time to start planning for that exciting family trip. Meanwhile, though, you can keep your kids busy with Dr. Panda Town: Vacation. It's the latest addition to Dr. Panda's series of urban-themed digital playsets, which we previously covered here and here. 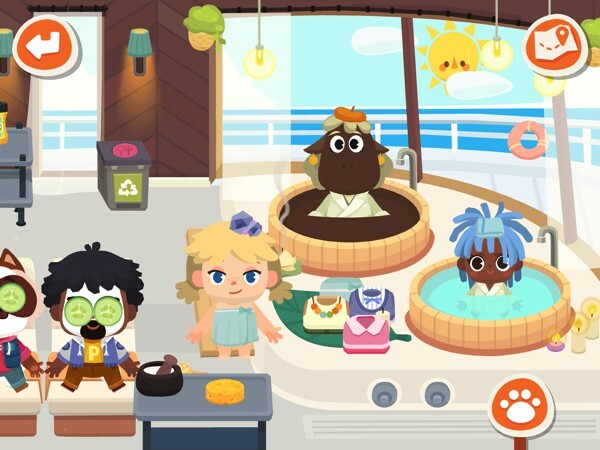 In this open-ended app, kids can explore and create stories of their own in a virtual cruise ship that features their favorite panda pal. Dr. Panda Town: Vacation offers 7 diverse areas to explore and more than 30 characters of various ages, ethnicities, and even species. Kids begin their romp on the virtual cruise ship's cockpit, at which point they can decide whether they want to see more of the ship or visit any of the three available islands. Whatever they choose, they are bound to discover tons of items and surprises. On the ship, kids can discover the fascinating apparatus in the cockpit (and try their hands at being captain), listen to live performances at the lounge, or chill at the observation deck. They can also head upstairs to the pool deck, where they can make a splash, ride cute floats, and grab some drink from the juice bar. If they want to relax, they can visit the spa for a rejuvenating mud bath. Should kids choose to get off the ship, they can visit the Winter Island, the Forest Island, or the Beach. On the Winter Island, they can ride a ski lift, snowboard on the mountains, and play ice hockey. On the Forest Island, they can have a barbecue by the camp fire, play outdoor games, and go fishing at the river. At the beach, kids can have a drink at the shack, play volleyball, or go parasailing. They can also go deep-sea diving to discover a sunken treasure ship and rich maritime life. Who knows, they might just find the hidden key to the treasure chest! Parents need to know that Dr. Panda Town: Vacation lets kids play however they like and create their own stories about the places and characters in the app. There is no right or wrong way to play, and there isn't any timer or score either. The app is all about play, and kids from ages three and up can join in on the fun, even if they aren't able to read yet. Dr. Panda Town: Vacation is free to download, but you will need to make in-app purchases (IAPs) to unlock the full content. These IAPs, as well as links to external sites, are secured by a parental gate to prevent kids from making unwanted purchases. The app has no third-party ads. Dr. Panda Town: Vacation is fantastic! There are so many things to play with and places to explore, and kids will have a blast recreating their dream holiday scenarios. Whether they want to have a drink and chat with friends by the pool, or toast marshmallows by the campfire under the stars, there's bound to be something for everyone. It's also fun to touch everything to see what would happen. For example, you can tap the sun in the sky to switch from day to night. You can also tap on lights or candles to switch them on, give your characters items to hold and food to eat, etc. Another neat feature is the ability to bring in items and characters between other Dr. Panda Town you already have. All your kids have to do so is tap the map icon on top right, then choose the location they want to visit. This allows them to stretch their imagination and create expansive storylines. Visit nearby islands and discover what the great outdoors have to offer! If you have little storytellers and Dr. Panda fans in the house, Dr. Panda Town: Vacation is must-have. With so many things to see and do, this app is a great value and will provide your kids with hours of quality playtime. What's more, they can move characters and items between Dr. Panda Town games they already have, allowing you to create interconnected stories. Recommended for ages three and up. Dr. Panda develops games with educational values that help kids learn about the world. All of their games are safe and do not contain inappropriate content. Dr. Panda Town is a must-have for kids who love storytelling and any Dr. Panda fan. It offers an expansive, colorful world where they can let their imagination run loose with their favorite Dr. Panda characters. Because there are so many secrets to uncover, they can spend hours and hours just having fun. Highly recommended. Dr. Panda Restaurant 3 is a fun, educational app for little kids who wish to have fun in the kitchen and learn a bit about cooking. It's easy to use and has no strict rules or scores. As kids play, they also unleash their imagination, learn to follow instructions, and read facial expressions. Recommended for any Dr. Panda fan!